A minute’s silence was observed for life member Frank Baker and Trevor Wells who passed away during the year. Sincere condolences from the club to both families. President Nigel Carter paid tribute to everyone who helped the club during the year, particularly club secretary Sue Moses and treasurer Dave Scobie. As green keeper he was pleased with the improvement of the green during the season and hoped to provide an even better surface in 2018. Captain Adrian Johnston thanked all the players who supported him once again. Also, thanks to Sue Moses who emailed members if we were short of players, we completed our fixtures with only a few hiccups. 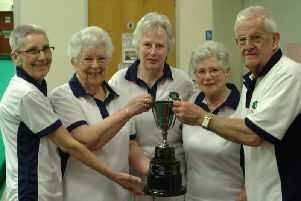 In the Warwickshire County Bowls triples Brian Boardman, Craig Carter and Tom Millership won the 2017 Birmingham Post Cup. Liam Pearcey and Craig Carter won the Rugby Bowling Association Coronation Pairs Cup and the club won the Finch Cup. Officers elected for the 2018 season are: President Graham Dales; Vice-President Nigel Hewitson; Secretary Sue Moses; Treasurer David Scobie; Captain Nigel Townsend; Vice-captain Keith Mason; Match Secretary Don Moses. Committee Adrian Johnston, Robin Whyman and Roger Smith. Publicity Officer, Bill Yates.